Q. Should I take some supplements? Some people tell me I don’t need them. A. 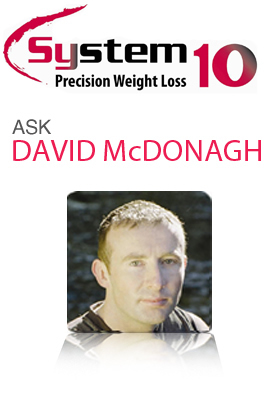 My answer to this is a definite YES, but select ones that you truly need and avoid taking excesses of any supplements. True in an ideal World be would not need any supplements because we would get all we need from our food intake. But how many of us consistently eat this well? So far no effective weight loss pill or herb exists! The results at best have been very poor even from prescription weight loss drugs. Don’t let those adverts fool you! You are going to have to change your diet and exercise sometime to get real results. To stop eating at 6pm is not beneficial and very often bad for your weight loss results! The ideal rule is to avoid a large meal within 3 hours of bed time and a smaller snack within 2 hours of bedtime. So count from your bedtime back and stop this miserable habit as you are suffering needlessly. L-glutamine to rebuild your digestive system and combat cravings! L-glutamine is an amino acid which is a building block for body proteins. It is the most abundant amino acid in the body, arguably the most important and has incredible functions and benefits. Super Star Supplements: Minerals – Why You Must Seriously Consider Them! Unless you eat a very well designed and carefully thought out diet there is growing evidence that many people are not getting enough of key minerals including calcium, chromium, magnesium and zinc. Indeed it seems that up to 80% of us can be deficient. This is very worrying because the situation is likely to be a lot worse for those on poor weight loss diets and those who exercise regularly. A broader understanding of the roles these minerals play will perhaps motivate you to pay closer attention to them. Remember you are most likely to be deficient in them right now especially these 4 below! Super Star Supplements: Green Tea – major protector and detoxer! First drunk around 2700BC, Green Tea has compounds that may provide powerful protection against cancers and heart disease as well as fighting infections and improving longevity. Its key ingredients are powerful anti-oxidants called polyphenols which help protect cells against damage. One large scale study in China found that people who drank green tea had much lower rates of rectal, pancreatic and colon cancers. In women the risk of rectal and pancreatic cancer was nearly halved! Preliminary research has indicated in might also protect against breast, stomach and skin cancers. This section is all about supplements that can make a significant difference in your life and especially for your metabolism and health or weight loss goals and Vitamin B5 certainly qualifies here. Vitamin B5 also known as Calcium Pantothenate or Pantothenic Acid is a member of the B complex family of vitamins. It has roles in cell building, maintaining normal growth, the functioning of the central nervous system and antibody production but it is its essential role in the conversion of fat and sugar to energy and the functioning of the adrenal glands that is of particular interest to us. Super Star Supplements: Probiotics – another of my top 10 supplements! Your digestive is the starting point of all body function and so an enormous amount of health problems originate here. Your digestive function begins with chewing, so by simply focussing on chewing more you can greatly help your body. There is nothing more destructive for the body then swallowing food, especially meats, poultry and fish in large lumps. Super Star Supplements: Milk Thistle – for your liver! Milk Thistle is one of the most researched herbs of all with over 300 studies done on its safety and benefits. It is best known for its amazing benefits for your liver. Three constituents, collectively known as Silymarin, are the parts of the herb responsible for these benefits. Omega 3 and Omega 6 are called essential fat families because you cannot make them in the body and must supply them from food. It is estimated that around 80% of people are deficient in these essential fats. They have incredibly important roles in the body including the prevention of heart disease and cancer, balancing hormones, preserving bone density, preventing allergies, depression and arthritis, reducing cholesterol and for brain and skin health.